Home> Mobile> Games> iOS iOSAndroid> Trivia ActionAdventureArcadeBoardCardCasinoDiceEducationalFamilyKidsMusicPuzzleRacingRole PlayingSimulationSportsStrategyTriviaWord> Are You an iDiot? Free Version! Trivia Questions Everyone Should Know! Are You an iDiot? Free Version! Trivia Questions Everyone Should Know! This is the FREE version! If you like the App, get the full version! There's a lot more questions everyone should know the answers to in the full version! Here's a question for you... Are you an iDiot? Let's find out! 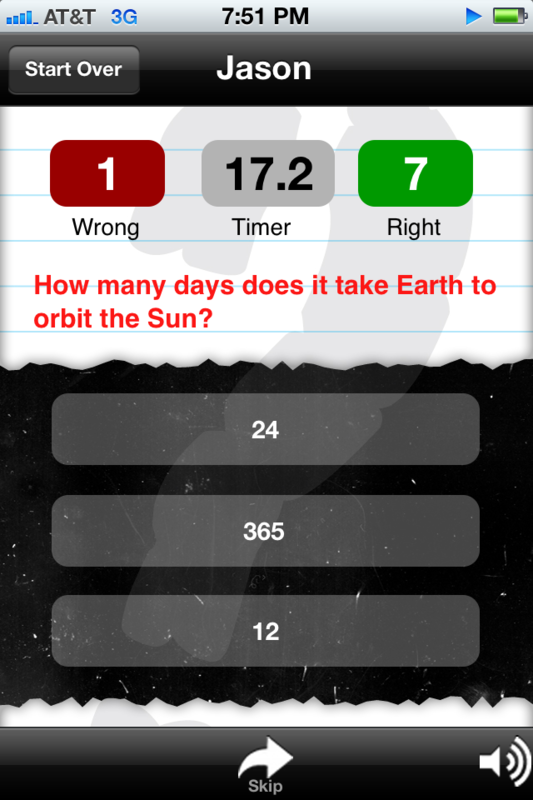 We've composed trivia questions that everyone should be able to answer. If not, just play it again and you'll learn! - A 5th grader can't answer all of them! - Share your results with friends (if you dare)! - Good for first dates! - This is not the typical Moron test! - There's not enough time to search for the answers! - Link to download full version in the app! We've got a whole lot more coming soon... Good luck! Are You an Idiot? 50 Trivia Questions Everyone Should Know!